As a dancer, Marcelo Gomes has it all—a magnetic stage presence, impeccable musicality, technique for days and world-renowned partnering skills. But the American Ballet Theatre star has also been gaining ground as a choreographer lately, creating works for Complexions Contemporary Ballet, galas and festivals. (He also choreographed Misty Copeland's famous Under Amour ad.) Tonight marks a major milestone in his choreographic career: His first full ballet for ABT, AfterEffect, has its world premiere at the David H. Koch Theater in New York. Gomes' new choreographic opportunity is a positive step for ABT, which has received criticism in the past for relying too heavily on guest stars and not developing its own dancers. With the recent promotion of Copeland and Stella Abrera, a talented roster of homegrown soloists and a 2016 Met season conspicuously light on guest artists, it looks like the company is making a serious effort to cultivate more from within. Why partnering couldn’t start soon enough: I had a crush on this girl at my school. Did anything happen? [Laughs] No. I had no confidence, so I never told her. She probably knew. Top mentors: My first partnering teacher, Dimitri Papadakos, was a former football player, never a dancer, and his advice was all about timing. Today, I go to Kevin McKenzie and Marcelo Gomes. There’s pride in good partnering at ABT. Do the women take advantage of that? Some do. [Laughs] They’re impatient with men who aren’t accomplished partners. But others are extremely easy to work with. I will say, when you work with someone who really makes you swallow your pride, it makes you a better partner. When to talk onstage: Only if something is wrong. For me, if you’re really in the show, you are that character. It becomes dangerous if I’m out there switching back and forth between Cory and Basilio, or Cory and Siegfried. Top choice for next partner: It’s hard to say. There are people who are so well-known and it feels like an honor to dance with them, but a lot of them have huge egos. Notable exception: Polina Semionova—when I finally got to dance with her, it was amazing. Partnering mantra: Keep her on her leg and don’t tick her off. Partnering rule: Take the blame, no matter what. 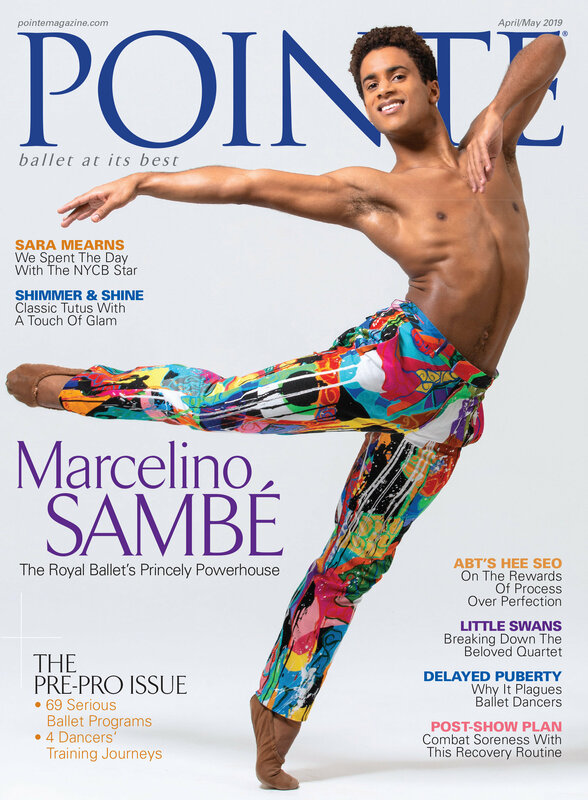 That’s what Jock Soto instilled in us, at the School of American Ballet: If something doesn’t work, it’s the boy’s fault. Now, I might not say that in the dressing room later on, but in public I’ll take full responsibility. It’s the gentlemanly thing to do. How to talk onstage: Through big smiles, of course. In Act II of Nutcracker, principal Kaori Nakamura and I have it down to a science. What do you talk about? Shopping, dinners, the dancing, how many more Nutcrackers we have to do. Top choice for next partner: Here at PNB? Leta Biasucci. She’s a corps member, gorgeous, has amazing technique, she’s fun—everything a ballerina should be. Everything she does comes from her heart. Rotating partners: I did Allegro Brillante a couple of seasons ago with my wife Megan Fairchild, Tiler Peck and Sara Mearns—all in the same week. They were three different ballets. I didn’t even pretend otherwise. The truth about partnering your spouse: Social niceties go out the window. Megan and I used to say, “You know I hate it when my partner does that, so why are you doing it?” We’d be short with each other sometimes, just because we felt like we could be. We had to get used to having a professional—as well as a personal—relationship. It took some practice, but we get along great now. We’re more polite. Pet peeve: Megan would say that I hate it when the girl drives, when she starts leading. I’m not doing anything else, so if you’re doing all of the partnering and the dancing, then I’m just walking around. Let me do my job. Diva ballerinas: The divas are usually the coaches at the front of the room. [Laughs] My coach for many years was Carla Fracci and she is a diva, you know? But she taught me so much, especially about Giselle. Top choice for next partner: Sylvie Guillem. I have so much love for her, and it’s not because technically she’s amazing. She has something inside her heart and brain that is always working and she knows how to manage herself. She’s unbelievable, that woman. Best way to approach a new partner: Do some homework first, and get to know what kind of a ballerina she is, whether athletic, someone who can really jump and turn, or more lyrical, flexible. The lyrical ballerinas, you have to maneuver them more—they are more work. Hero: My very good friend, Marcelo Gomes. His eyes aren’t always glued to the woman. It’s a great partner who can just feel the ballerina, where she is, at any time. Pet peeve: When a ballerina is insecure onstage and a mistake happens and she doesn’t know how to just absorb it and move on, so you hear these sounds of frustration about the performance. Top mentor: Attilio Labis at the Paris Opéra Ballet School. He focused on teaching you how to do things the opposite way. For example, people use their right hands a lot, so he made us work using only the left hand. Partnering mantra: Take care of her. She is your responsibility from the moment you walk onto that stage. In July, an exceptional American Ballet Theatre dancer made her New York debut as Juliet—a sparklingly innocent and yet impressively mature rendition of Kenneth MacMillan’s heroine that was both touching and daring. She danced with abandon, sailing into the arms of her partner and giving each pirouette the appropriate tinge of ecstasy or despair. But what was most surprising was that this ballerina, Hee Seo, is listed in the corps de ballet. For several years, there has been a buzz about Seo. But ABT’s 2009 Metropolitan Opera spring season was without a doubt her breakthrough. She performed leading roles in Romeo and Juliet, La Sylphide, Alexei Ratmansky’s On the Dnieper and James Kudelka’s Désir. And she demonstrated that mark of a true ballerina: the ability to carry a ballet and imbue it with her distinct aura for an audience of nearly 5,000 people. What is it that has propelled her into the coveted ABT limelight? The plasticity of her body is reminiscent of a young Natalia Makarova, with all movement emanating from a supple spine and technique that spellbinds with its combination of tensile strength, lightness and fluidity. But Seo is her own dancer and doesn’t need comparison. She has a dramatic quality that radiates from her soul. “Beyond her ballet-friendly physique, she has a point of view and sensitivity that leads her towards roles like La Sylphide and Juliet,” says ABT Artistic Director Kevin McKenzie. Born in Seoul, South Korea, Seo began dancing at age 11, receiving her primary training on a scholarship at the Sun-hwa Arts Middle School. At 13, she earned a scholarship from the Universal Ballet Academy (now The Kirov Academy of Ballet) in Washington, DC, where she worked with the legendary Kirov ballerina Alla Sizova in a strict curriculum that adhered rigorously to the Vaganova syllabus. In 2003, Seo won the Prix de Lausanne, which earned her a scholarship to the John Cranko Ballet Academy in Stuttgart. That same year she also won the Youth America Grand Prix, and John Meehan, then the director of the ABT Studio Company (now called ABT II), offered her a contract. She was allowed to defer one year so she could continue her training in Germany. Once she arrived in New York, her experience with the Studio Company was initially disorienting. Russian-trained, Seo wasn’t used to the American approach to dancing and had trouble picking up styles quickly. She felt lost. One day Meehan called her into his office, and Seo broke down in tears. “From the bottom of my heart I wanted to get better, break down the barrier and step up,” she says. “But I didn’t know what to do.” With help from Meehan (“He was like a dad to me”), she began to change, to learn new ways of working. In January, McKenzie casually mentioned to Seo in the hallway that she’d been cast as Juliet. She was ecstatic. She and partner Cory Stearns rehearsed rigorously for two months to make the ballet feel comfortable. The two are close friends from their days in the Studio Company, although his quirky American sense of humor offended her Korean sensibility enough to prompt her to stop talking to him for nearly a year. (He would joke about Korean food, but she says, “If you really understand and know him, you have to love him.”) They debuted in the ballet in Detroit on March 14, Seo’s 23rd birthday, with nearly the entire company watching. At a studio rehearsal in June, in the bowels of the Metropolitan Opera House, former ABT ballerina Martine van Hamel coached Seo for her debut in another principal role: the sylph in La Sylphide. Van Hamel advised her to contain the delicate Bournonville movement without losing its breadth. Five minutes later, Seo was rehearsing the peasant pas de deux from Giselle, attacking the allegro batterie. Afterwards, she sat on the floor, beat on her thighs and commanded her body to cooperate. It was that kind of season. Seo speculates that some of her ability to inhabit dramatic roles stems from her own experience. “Because I left home when I was so young, I never could be childish. I had to be an adult. I had to grow up.” Like Juliet and other heroines she longs to dance, such as Tatiana in Onegin and the protagonist in Manon, she faced challenging circumstances being away from her family at a young age. In their New York debuts in Romeo and Juliet, Seo’s and Stearns’ long, modern lines underscored the dramatic sweep of the ballet. Seo moved with a wind-driven passion. With time, the nuances of her performance and the dynamics of Juliet’s dramatic arc will surely expand. At the end of the performance, which also celebrated Frederic Franklin’s 95th birthday, Seo and Stearns took their bows to a cheering audience. Franklin, dressed in costume as Friar Lawrence, accepted a bouquet from Seo and kissed her sweetly. It was as if he—and ABT—were officially consecrating her as a ballerina. Joseph Carman writes about dance and is the author of Round About the Ballet. It is late afternoon on July 4. In a substage rehearsal studio, ABT ballet mistress Georgina Parkinson watches Hee Seo stretch out. Parkinson is set to rehearse Romeo and Juliet with Seo and Cory Stearns, both of whom will make their New York debuts in the leads in five days. When Stearns breezes in, Seo—the picture of restrained, unflappable grace—straightens her back and gazes up. They exchange giddy, grinning glances and the sight evokes Shakespeare’s young lovers. Flushed and exhausted, Stearns has come from dancing Orion in Sylvia, where he strained a muscle in his right leg. “I’m just a little heavy in the calves,” he assures Parkinson. And then he and Seo launch into the balcony pas de deux. By their Thursday night debut, they will have fixed the slight imperfections that surface in rehearsal. During a lift in the balcony scene, he will keep his beaming face fixed in a clean profile line; she will straighten her back and sit like a swan in the arms of her newfound love. Their fresh sentiment and vigor will lend a youthful verisimilitude to the ballet that even many principals can’t conjure. On debut night, the youth and energy of Stearns’ and Seo’s star-crossed lovers was palpable. Despite reinjuring his calf mid-performance, Stearns pushed forward. “Sure, it’s disgustingly tiring,” he said lightly several days later. ”But this role is a process. It’s something you develop over the years.” And Stearns has many years of Romeos ahead. the beginning of January, three years after becoming a member of ABT’s corps de ballet. --Manuel Legris will direct the Vienna State Opera’s ballet beginning in 2010, upon retiring as an étoile with the Paris Opéra Ballet. In his new position, Legris will work to grow the troupe’s international reputation. --James Canfield was chosen as Nevada Ballet Theatre’s next artistic director after serving as the interim artistic director since March 2008. Canfield will lead the company through its transition to a new home in the $475 million Smith Center for the Performing Arts.